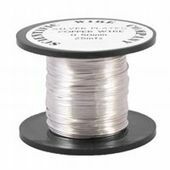 0.71mm Craft Wire. Used widely in jewellery and craft projects. Suitable for ring bases, making frames, structures and shapes, creating links and much more!